Christian Thielemann, Rolando Villazón, Michael Dangl et al. Tannhauser or Il Trovatore? Rienzi or Aida? Fish or fowl? The decision between Wagner and Verdi devides opera lovers into cultural enemies. Giuseppe Verdi, the Southern European, is famous for his anthropocentric work - lovely, melodic, tragic and true-to-life. The German Richard Wagner is known and admired for his heroic legends and myths - tremendous and expressive. 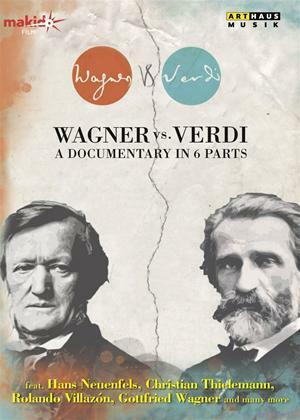 The 6-part documentary series Wagner vs. Verdi presents different and very personal perspectives of work and impact of both giants of music theatre, using interviews with famous interpreters of both composers and live recordings from some of the world's major opera houses like the Bayreuth Festival, Arena di Verona or Gran Teatre del Liceu.